This year, in some ways, Coursera changed more from the inside than it did from the outside. In 2017, Rick Levin handed over the reins to Jeff Maggioncalda, who joined Coursera as its new CEO. Rick Levin did leave a gift for Jeff: a $64 million Series-D funding round (reportedly at a $800M valuation). After Jeff got settled in, he pushed out some of the existing leadership. Going forward, he reportedly plans to restructure the company similarly to his previous company, Financial Engines. Jeff served as CEO of Financial Engines, which he took public in 2010. In 2016, during an interview with Bloomberg, Rick was asked where Coursera will be in five years. He answered: “we will be public by then.” The new Coursera CEO comes with that experience. In terms of the total number of learners, Coursera added 7 million new learners and crossed the milestone of 30 million learners. 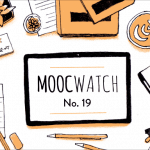 Coursera is still the largest MOOC provider in the world by a considerable margin. But the real growth came from Coursera’s B2B push. The platform now has 500+ corporate partners, which is up from 30 the previous year. We also saw the return of Andrew Ng, the Coursera co-founder who launched a really popular Deep Learning Specialization. For more of Class Central‘s analysis of Coursera’s 2017, keep reading. Let’s take a look at each of them separately: where they are in progress, and how they did in 2017. This is what most of us know Coursera as, and it’s how Coursera got started. But this might not be the primary focus of the company anymore as it tries to expand its other business units. Coursera now has over 30 million learners signed up on its platform, which is up from around 23 million learners in 2016. In 2017, Coursera added around seven million learners. This number is similar to the six million new leaners they added in 2016 and 2015. At one time Coursera boasted that it reached its first million users faster than Facebook did. Now with the push towards monetization, the total number of users on the platform is not the most relevant metric for the company’s success. Rather, the number of paying users (which grew by 70%) is a more important measure. Over time, Coursera has pushed its learners aggressively towards paying for more and more features, many of which were initially offered for free. This aggressive monetization prompted us to write articles like this one, showing users how to continue to access free course content. In 2017, Coursera continued its drive to monetize its user base. First, Coursera changed how it processes Financial Aid applications. Now there is at least a fifteen day delay (previously applications had been approved immediately) and applicants need to write a 300 word essay on why they cannot pay. Find more details here. 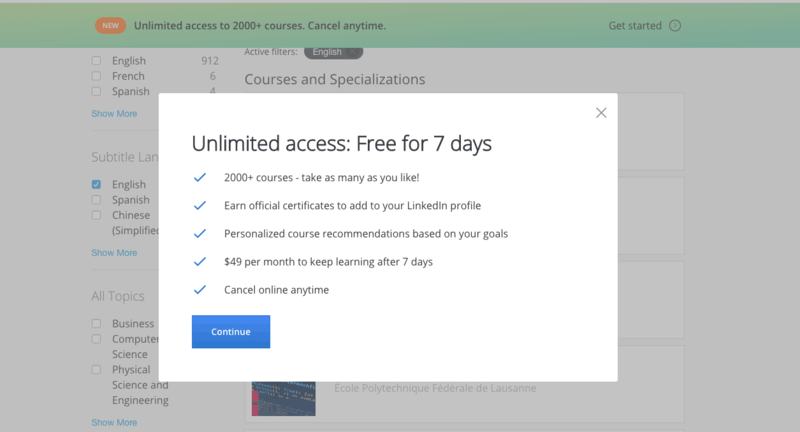 Second, Coursera also tweaked its subscription model and added a seven day free trial. 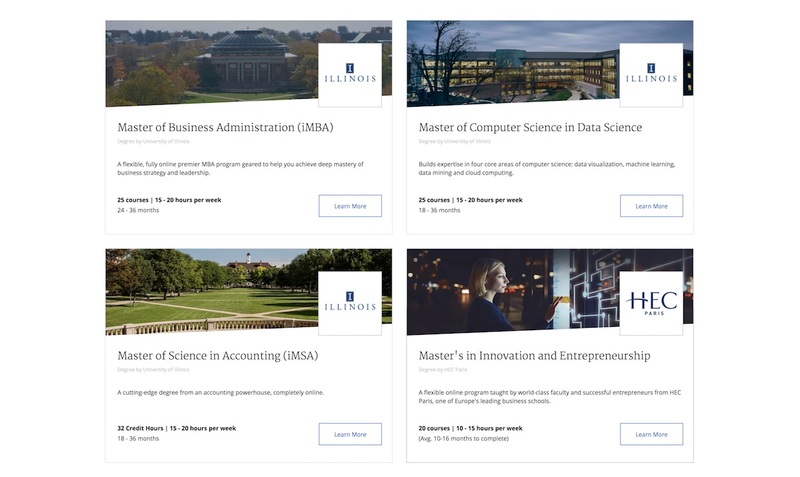 Another experiment that Coursera is running currently is a single subscription price for its entire catalog, as opposed to subscriptions to individual Specializations. This platform-wide subscription costs $49/month and has not been rolled out to all users. But there are also some indications that the experiment has ended and Coursera has decided not to move ahead with the single subscription model. These constant tweaks to Coursera’s business model seem to be working. The number of paying users on Coursera has grown by 70% compared to 2016. Last year, Class Central estimated Coursera’s B2C revenues at $50–60 million. If our figures are correct, Coursera is now within striking distance of $100 million dollars in annual revenue. 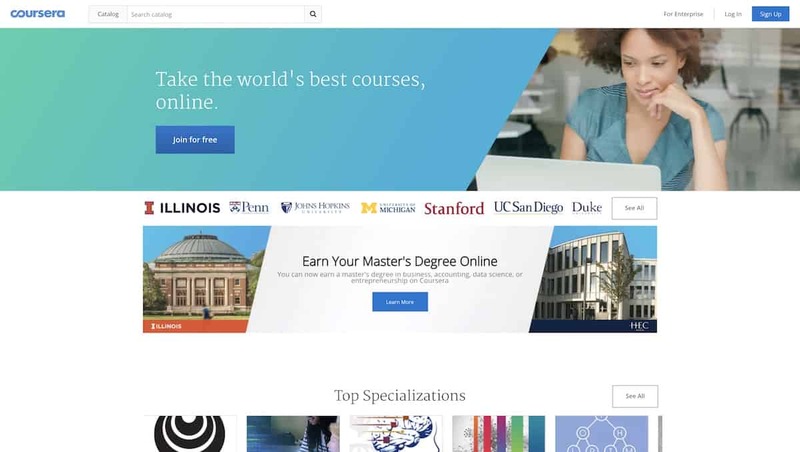 Coursera now boasts a course catalog of 2,700 courses, with 800 of those added in 2017. Overall, Coursera has launched more than 3,000 courses (a few hundred of those went offline forever last year). Almost 50% of its courses are in the fields of technology and business (up from 40% last year), which is another consequence of Coursera’s push towards monetization. Below is a list of its most popular courses in 2017, which Coursera provided to Class Central. This list is based on average daily enrollments. Only one course in the list was launched in 2017; it was by Coursera co-founder Andrew Ng and occupies the #2 spot. Ng’s course on Machine Learning, the course that launched Coursera itself, occupies the #1 spot. Interestingly, only one course in the list was released in 2016. The rest were launched in 2015 or earlier. A good number of the new courses added in 2017 were part of Specializations. Coursera has around 236 Specializations in total, 57 of which were added in 2017. 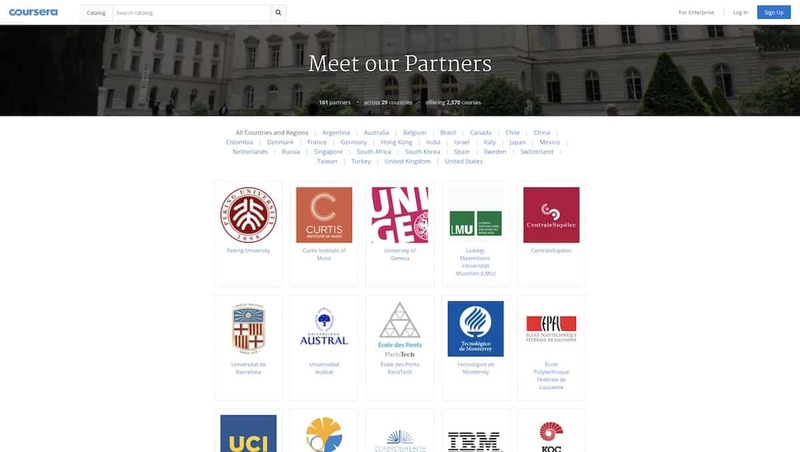 Coursera currently has 161 partners (up from 147 last year) from 29 countries offering courses on its platform. Most of the new partners added this year are not universities but corporations. Corporations that have launched courses on Coursera (some in partnership with university providers) include: Google, MongoDB, Autodesk, ISC^2, Sberbank, H2O.ai, Atlassian, Nvidia, Cloudera, Yandex, Hubspot, C3IOT, Goldman Sachs, Unity, IBM, and PwC. Coursera co-founder Andrew Ng’s Deep Learning Specialization is listed under his company — Deeplearning.ai — instead of Stanford. 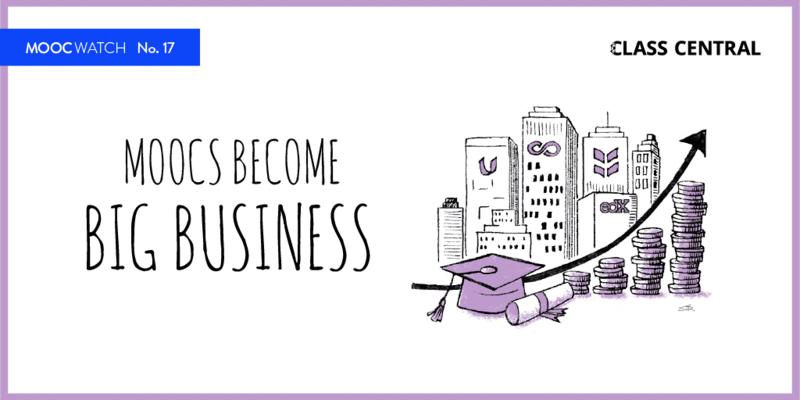 Last year, Coursera formally announced its Coursera for Business initiative. 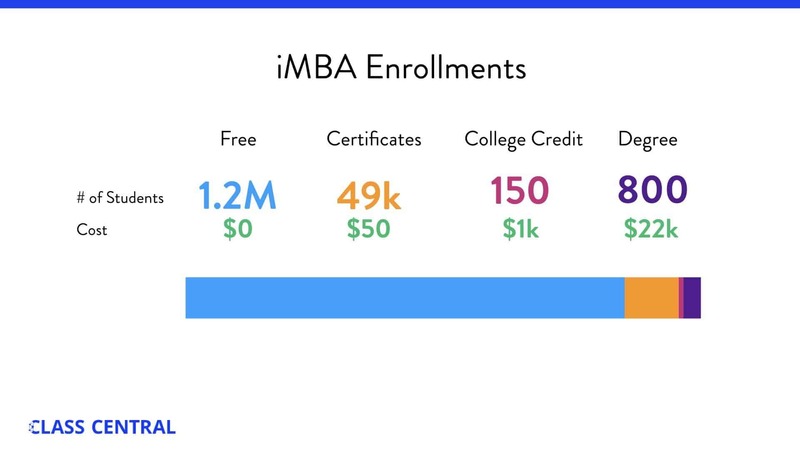 Coursera for Business is basically companies paying so that their employees can get access to Coursera’s consumer products. On top of that, participating companies also receive some analytics on how their employees are learning on Coursera. The corporate learning space is already crowded with well-established competitors, such as SkillSoft, Lynda.com, Pluralsight, and others. These companies generally provide course content. Thanks to its partnerships with universities, in addition to course content Coursera can also provide highly valued university-backed certification. For the moment Coursera for Business is priced higher than its competitors. It costs $150/year per employee for one course, or $400/year per employee for unlimited access. 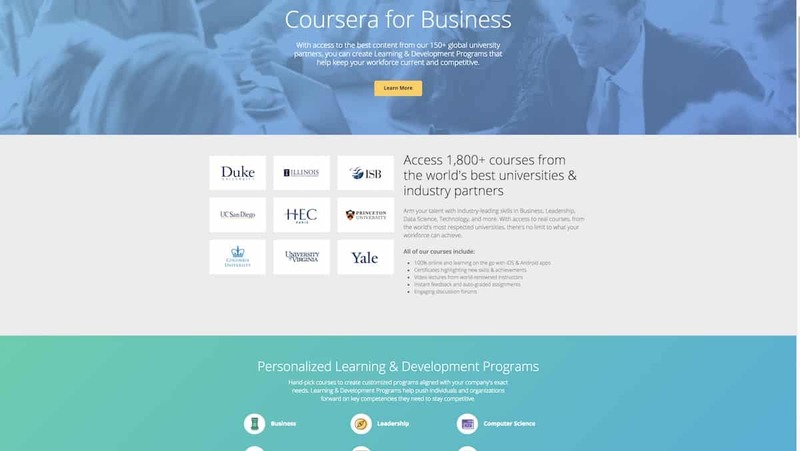 In 2016, Coursera had 30 companies that had signed up for Coursera for Business. 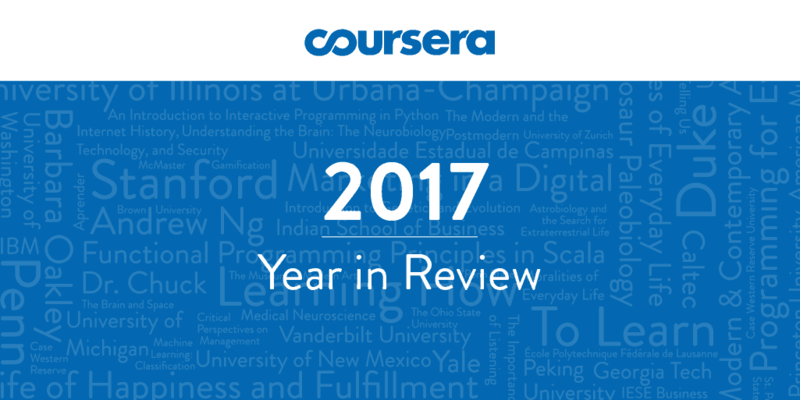 Coursera ended 2017 with more than 500 companies signed up for the service. Though bookings have grown 400%, they haven’t grown at the same rate as the number of companies. It probably means not all companies have fully committed to Coursera for Business and are maybe still trying it out. Master of Business Administration (iMBA) from Illinois. Master of Computer Science in Data Science from Illinois. Masters of Science in Accounting (iMSA) from Illinois. Master’s in Innovation and Entrepreneurship from HEC Paris. The iMBA was Coursera’s first degree program. It currently has around 800 students enrolled. At the cost of $22,000 per student, the iMBA alone generates $17M in revenue. The courses that make up the iMBA remain free to audit and can be taken individually for certificates. 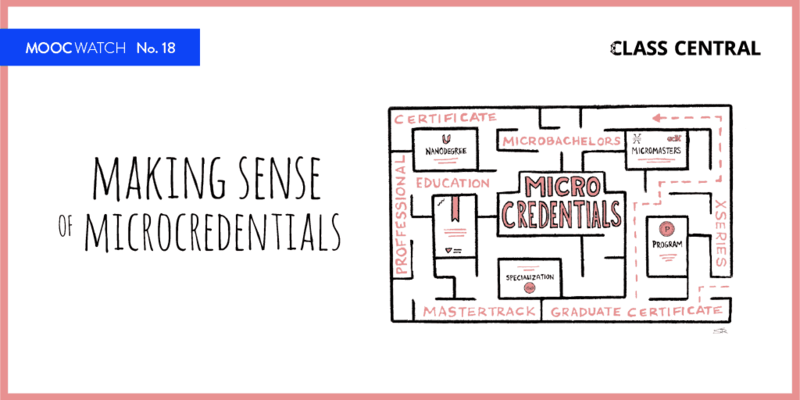 Over 49,000 certificates have been issued for courses that are part of the iMBA. Recently, the iMBA graduated its first cohort of 69 students. In 2017, Coursera announced another large funding round of $64 million. The majority of funding for this Series D round came from existing investors: GSV Asset Management, New Enterprise Associates (NEA), Kleiner Perkins Caufield Byers (KPCB), and Learn Capital. The Lampert Foundation also participated as a new investor. Coursera’s previous round of funding, which they wrapped up in October 2015, was for $60 million. So far Coursera has raised $210.3 million in total. According to TechCrunch, the last round came in at a valuation of $800 million. Before becoming Coursera’s CEO earlier this year, Jeff Maggioncalda was the co-founder of Financial Engines, along with Nobel Prize winner Bill Sharpe. Jeff was the CEO of Financial Engines for eighteen years. During that span, Jeff took the company public and ran it for five years as a public company CEO. 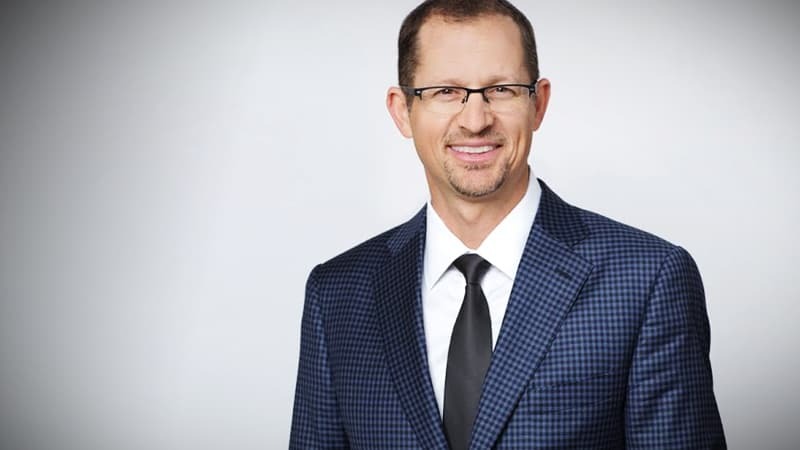 Jeff probably brings many qualities to the table as the new CEO of Coursera, but his experience with taking and running a public company will be particularly valuable to Coursera if it is to go public. Rick Levin has stayed on in the role of a senior advisor. On August 15 2011, Stanford professor Andrew Ng uploaded an intro video on YouTube for his free online Machine Learning course. Exactly six years later on August 15 2017, the first classes from Andrew Ng’s Deep Learning Specialization on Coursera went live. 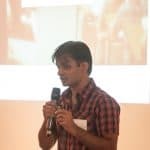 His new Deep Learning Specialization is already the most popular specialization on Coursera, and the first course of the Specialization is the second most popular course on Coursera. In 2017, Coursera introduced Learning Paths for the first time. This is how it works: learners are taken through a series of steps where they specify their goals. 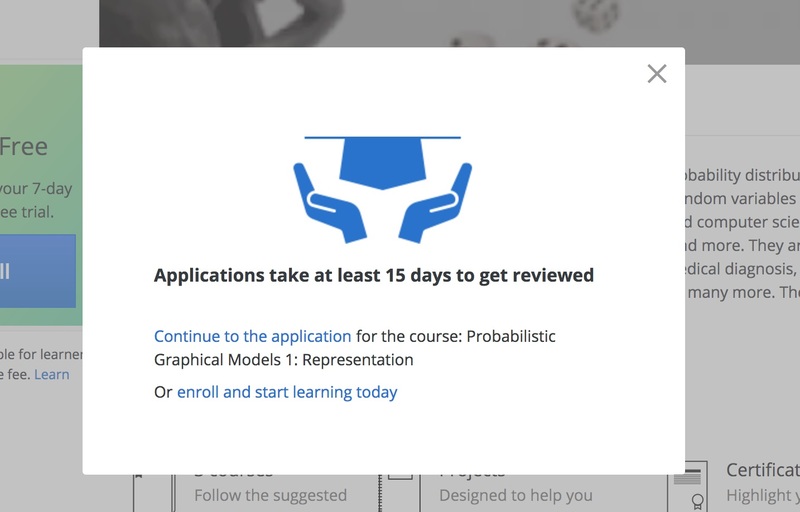 For each goal, Coursera recommends a set of courses to take. Currently, Coursera has 68 goals to choose from. 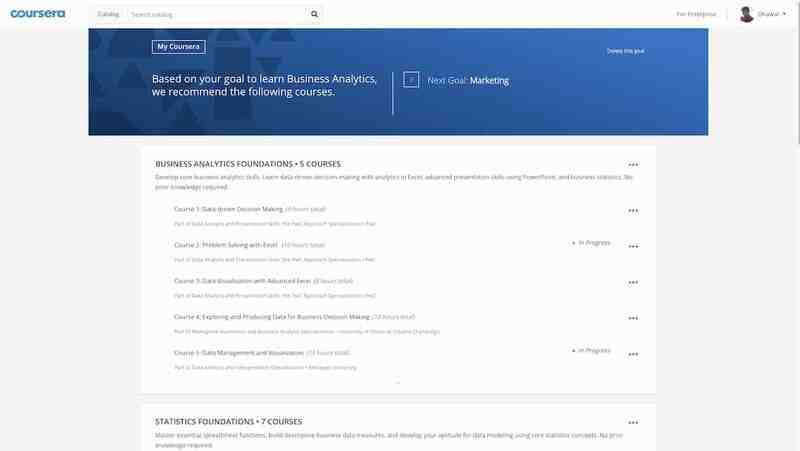 At the moment, some Learning Paths feel like a well-thought-out approach to reaching a certain goal (the one on Business Analytics, for example), while others just point to a single Specialization or to all the courses Coursera has on a particular topic. The one issue learners might face is that those who want to earn certificates for courses which are part of a goal might have to pay for each Specialization or course separately. If Coursera rolls out its single subscription price for the entire catalog to everyone, the Learning Paths would be a lot more manageable. 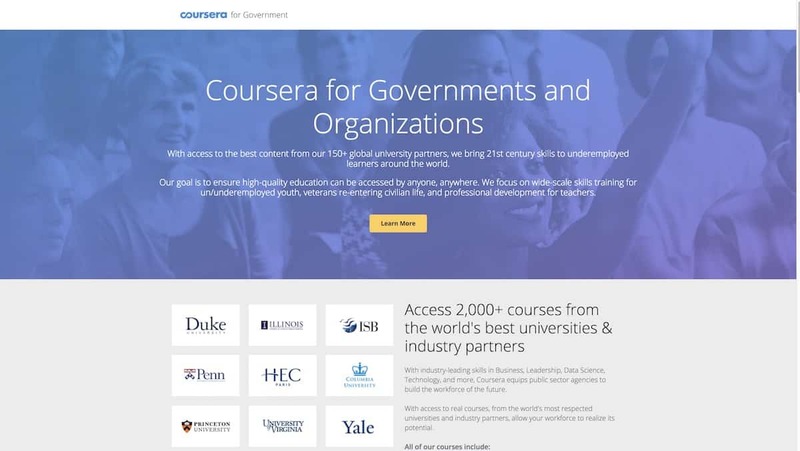 Early in 2017, Cousera announced Coursera for Governments. Its launch partners included government bodies in countries including the USA, Egypt, Pakistan, Singapore, Malaysia, Kazakhstan, and Mongolia. Coursera for Government is the same as Coursera for Business: it has similar features and pricing, but a slightly different landing page. It is unclear how actively Coursera is pursuing this path given that Coursera’s Head of Government Partnerships, Rebecca Taber, left the company in July 2017 (according to LinkedIn). 7. subscription model ($49/month) halted?